Earlier on in the year I wrote a review about Slacko Puppy . A new version of Slacko Puppy is now available (version 5.4). 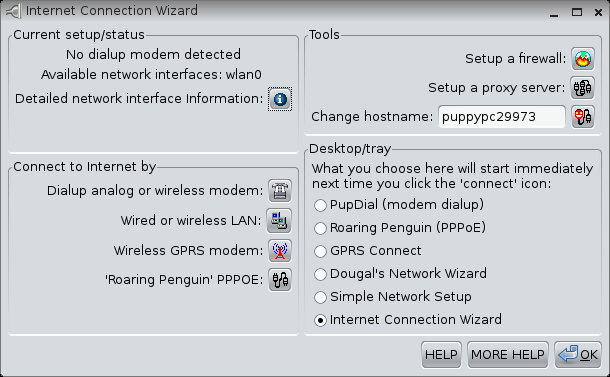 You can download the latest version of Slacko Puppy from http://puppylinux.org/main/Download%20Latest%20Release.htm. The point of this article is to highlight improvements that have been made and to make people aware of Slacko Puppy who perhaps did not read the first article. Last time I tested Slacko Puppy I did so on my Samsung R20 laptop which is a few years old but a decent enough machine for running most versions of Linux. This time I have decided to try Slacko on a netbook (Acer Aspire One D255). It has a 1.66 Intel Atom Processor with 1 gb of ram and a 160gb hard drive. Other versions of Linux provide live versions of their operating systems in order to enable you to try out the features. You can usually use the versions of Linux in their entirety. The live experience though is usually a taster to the true experience you would get by installing the full system. With Puppy Linux it is different. Puppy works perfectly from a USB drive and at no point is installing Puppy to a hard drive considered to be a better option than installing to a hard drive. Therefore when you boot Slacko Puppy for the first time you are seeing the full operating system. All the software is lightweight as Puppy is designed to run from memory. When you first boot into Slacko you are provided with a welcome screen which lets you define initial settings such as your location, timezone, keyboard layout and screen resolution. After entering these details and clicking ok it is a good idea to reboot your computer as this gives you the opportunity to create a save file. A save file (with extension .sfs) is a file that is created on your hard drive (which can be within a Windows partition, Ubuntu partition or anywhere you choose). You define how much space you want to give to the save file and all your documents, music and other files created within Slacko will be saved to this file. The next time you boot into Slacko the save file will be loaded. The save file will not affect your existing operating system and merely exists as a file. When you boot up for the second time (after the save file has been created) you will be presented with the above screen which gives you the option to use the internet connection wizard, enter the settings screen or get help. The internet connection wizard might be confusing if you see it for the first time as there are just so many options. Generally I find the Simple Network Setup wizard works very well if you want to connect to a wireless network. The simple network setup wizard shows a list of interfaces such as ethernet (eth0) or wireless (wlan0). As you can see I have one wireless interface available. 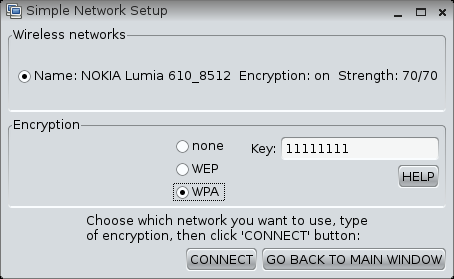 Clicking on the wlan0 button provides a list of available networks. As I am sat on a train I used my mobile phone and set the internet connection sharing on. If I had my mobile broadband with me I could have connected to this as well but the theory is the same. Choose the connection and enter the key. Puppy Linux places a lot of icons on the desktop and although I normally like the minimalist desktop it really works well with Puppy Linux. The reason icons work so well becomes clear when you realise just how many applications are installed by default. Having icons makes it much easier to do the more common things. The layout of the icons is well laid out as well. There are five basic rows of icons on the left hand side, a row of drive icons just above the taskbar panel and on the right hand side a few special icons. File, help, mount, install, setup, edit and console. These icons are useful for administering the system by providing access to the file manager, giving the ability to mount drives, install applications and access the terminal. Write, calc, paint and draw. These icons are more application based giving you the ability to write documents with Abiword and create spreadsheets with Gnumeric. Browse, email and chat. These icons are for online connectivity. Browse the web, send and read emails and chat using IRC chat. Plan and Play. This row is a bit more eclectic. The plan icon provides a calendar for creating appointments and play provides access to the media play. Connect. Just one icon which provides access to the internet connection wizard. As mentioned before all your mounted drives are shown just above the task bar. You should be careful when accessing the drive of your main operating system and you should not delete files as this can cause corruption. On the right hand side of the screen are icons for zipping files, the recycle bin and an icon to lock the screen. At the bottom of the screen is a familiar task bar. There is a menu which pulls up a list of categories. There are quick launch icons for showing the desktop, browsing the web and opening a terminal. Next to the quick launch bar is an icon showing 4 virtual desktops. On the right side there is a system tray with icons for showing the network connections, battery life, audio and of course the clock. To change the desktop background click menu -> desktop -> settings -> Nathan Wallpaper setter. You can choose from a pre-defined set of backgrounds or find one of your own. it is also possible to change the icons used on the desktop. To do this select menu -> desktop -> settings -> Desktop templates for desk items or Desktop drive icon manager. There are far too many applications included by Slacko Puppy to list in a review. For word processing there is Abiword and for spreadsheets there is Gnumeric. Rox is used as a file manager, Geany is installed as an editor (bit of an understatement that. Geany is a brilliant editor and is great for editing XML, PHP, PERL, C++ and other files). With this release of Slacko you could choose when downloading the ISO whether to download an image with Firefox or Opera installed by default so the browser installed is dependant on the version of the Slacko ISO that was downloaded. There are tools for downloading websites, ftp clients, capturing screenshots, resizing images, connecting to remote desktops, torrent clients, cd rippers and music converters. The highlight for me out of all the applications is PMusic. I recently wrote an article called 4 of the best music players for Linux. I should have included PMusic but it has to be said this is a great music application. With the ability to add 1000s of radio stations and then rip the audio from any of those stations to MP3 files whilst omitting all adverts and parts of songs makes it a great resource. I can’t wait for a version of Puppy for the Raspberry PI. PMusic would be great on the Raspberry PI. My favourite web browser is Chromium but this was not one of the ISOs available. I suspect the reason for this is that Puppy Linux runs as the root user and Chromium doesn’t like to be run as a root user. 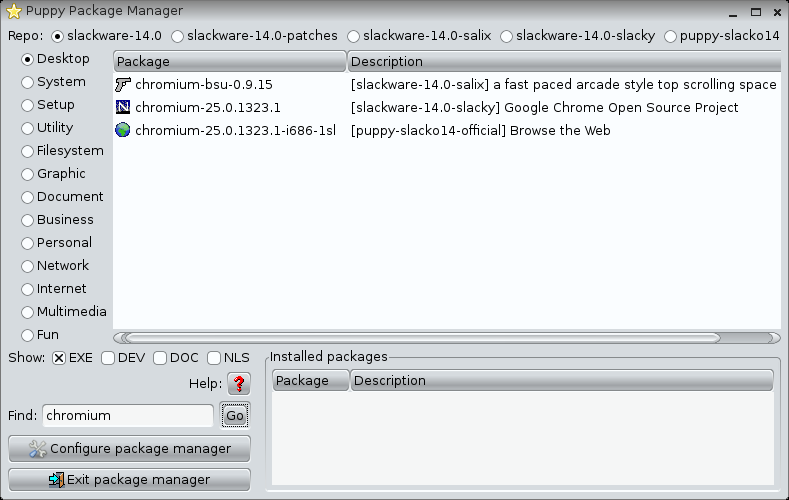 There are two ways to install applications in Slacko. The first is to use the Puppy Package Manager which within Slacko provides access to a number of Slackware repositories. Puppy packages are called PETS. To find a PET enter a package name in the find box and click Go. You can choose to search just one repository or all of them. As you can see from the image above Chromium is within the repositories and can be installed simply by clicking on it. The second way to install packages is to load an SFS file which is a save file which has the software installed within it. A great feature in Slacko is the ability to load and unload SFS files on the fly. If you therefore have the need to run GIMP then you will know that this is a resource hungry beast of an image editor. 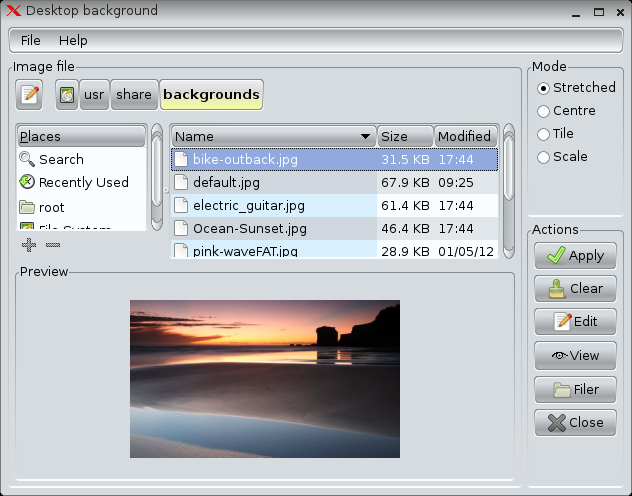 You can choose to load GIMP as an SFS file. Once you have finished editing your images you can unload the SFS file. The trouble with running Chromium in Slacko or indeed Puppy Linux in general is that Chromium doesn’t like to be run as a root user. To get around this you need to add –user-data-dir to the command that runs Chromium. I found 2 ways around the error. The first is to go to /usr/share/applications within the file manager and edit the file Chromium.desktop. Find the line that says exec= and add the –user-data-dir after chromium. Save the file and drag it to the desktop. Now rename the icon by right clicking on it and clicking edit item. Now when you click this icon Chromium will work. The other way was to click the settings button and find the default app manager under the Utility tab. Change the browser to Chromium. Now on the desktop right click the browse icon and select edit item. Now in the arguments box enter –user-data-dir. Now when you click the browse icon Chromium will run. If anyone has a better method please feel free to add it to the comments section below. Normally when I write a review I start off with testing Flash and MP3s. Well I can tell you that both work out of the box within Slacko as the above image testifies for Flash and the PMusic application testifies for MP3s. I kind of stumbled across this by accident and scared me the first time it happened but by shifting an application up the screen it moves it to another desktop. If you move it to the right it moves to another desktop. You can move the applications in all 4 directions and it will shift between the virtual desktops available. Slacko works great. If you come from a Slackware background then you might prefer to use this over Precise Puppy. If you are from a Ubuntu background then you might still prefer Precise Puppy or MacPup. In reality there is very little between them as they are all very good. Puppy Linux is brilliant. It is the sheer number of cool little tools and gadgets that makes it brilliant. 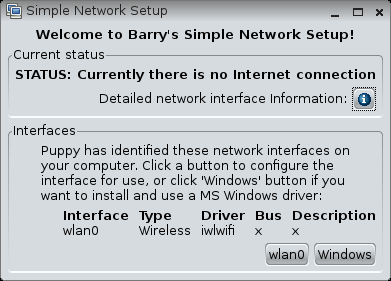 It is the fact that the programs are named so simply (“Barry’s Simple Network Setup”, “Nathan’s Wallpaper Setter”). Puppy Linux does exactly what it says on the tin. "The trouble with running Chromium in Slacko or indeed Puppy Linux in general is that Chromium likes to be run as a root user." OOps. Might want to change that typo to "chromium does not like to be run as root user". Nice blog post though for the chromium fix. Happy trails from a Linux Biker. "I can't wait for a version of Puppy for the Raspberry PI. PMusic would be great on the Raspberry PI." This is currently at Alpha 4 stage and uses older Squeeze code"
I would love to see a review of Puppi running on the Pi. 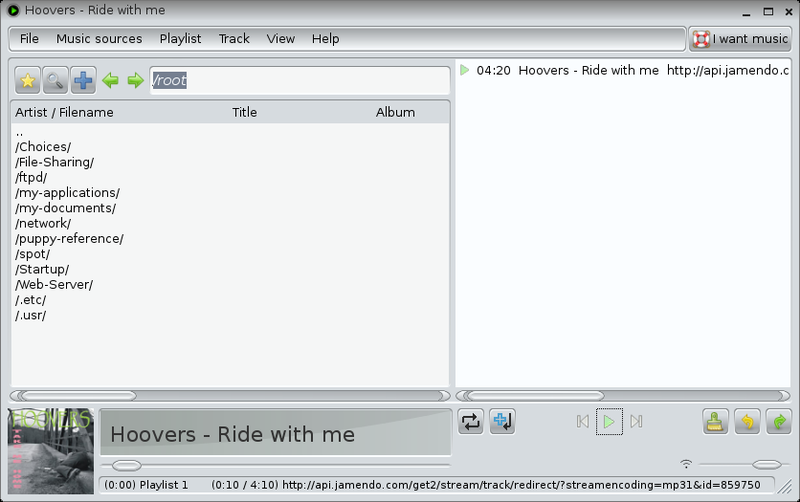 With VLC and a browser and bluetooth dongle you could watch streaming ShoutcastTV channels and youtube etc. I've been using Puppy off and on since before Lucid but the more time that passes the more I use it instead of Windows. I'm a former Lubuntu user, running Slacko in RAM since my hard drive started giving me problems. It doesn't have everything I want but I just SSH somewhere else for programs that don't run here. I don't understand slapt-get and the ppm very well but I'm computing every day and it works.